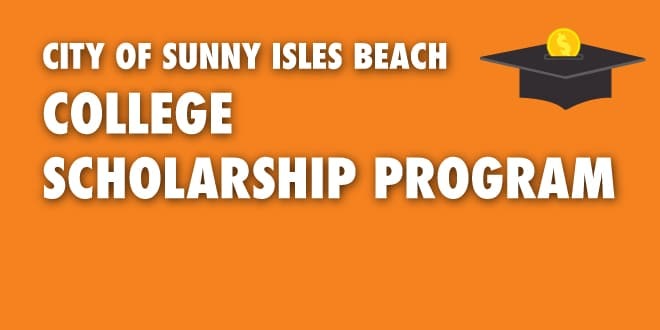 Each year, the City of Sunny Isles Beach awards college scholarship money to well-deserving Sunny Isles Beach high school seniors. Although there are only a limited number of scholarships available, we certainly encourage all students to apply. High school seniors are able to apply for these scholarships by filling out an application and writing a 200-300 word essay on a certain topic. Applicants must have been residents of Sunny Isles Beach for a year prior to January 1, 2019. Applications are also available in person at the Sunny Isles Beach Government Center and Pelican Community Park. Printed applications can be submitted in person to the Sunny Isles Beach Police Department 2nd Floor, Government Center, Attn: Barbara Valera or via U.S. Certified Mail to: Sunny Isles Beach Police Department 18070 Collins Avenue 2nd Floor / ATTN: Barbara Valera, Sunny Isles Beach, Florida 33160. Applications must be complete and submitted by Friday, March 1, 2019, by 5:00 pm. Scholarship winners will be personally notified no later than Friday, March 29, 2019. Formal award will be announced on April 18, 2019, at the monthly Commission Meeting. Applicant must be a current resident of the City of Sunny Isles Beach for a minimum of one year prior to January 1, 2019. Applicant must be a graduating senior enrolled in a public school or an accredited private school. Applicant must perform a minimum of 100 hours of community service with the City of Sunny Isles Beach by January 1, 2019. *Note: The scholarship application will detail additional requirements and optional service/activities. Questions regarding the application process may be directed to the Scholarship Committee at scholarship@sibfl.net.